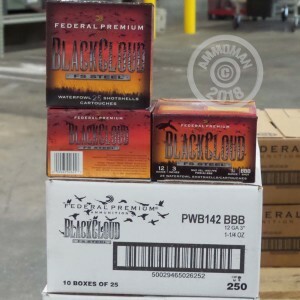 Give your shotgun a boost against waterfowl with this 12 gauge Federal Black Cloud ammunition. These 3" shells fire a 1-1/4 oz. hybrid payload of traditional round pellets and sharp-edged FliteStopper pellets designed to down birds quickly and cleanly. The shot sized used in these shells is BBB, which measures about .190" (4.83mm) in diameter and delivers better penetration against larger waterfowl than smaller birdshot types. A muzzle velocity of 1,450 feet per second ensures solid patterning even at extended ranges. Black Cloud ammunition is loaded in Anoka, Minnesota using lead-free components and FliteControl wads. The FliteControl wad is a rear breaking design that keeps the shot bunched up for a few yards after it leaves the barrel of your shotgun. This means the pellets start to spread a bit later and produce tighter patterns at any given distance than those fired with normal wads. Grab this 250-shell case or any other items totaling $99 or more at AmmoMan.com to qualify for free shipping!